ROBERTA: Today JRW welcomes Alicia Rasley to talk about plotting problems-my biggest nemesis! Alicia is a teacher, writer, and editor. 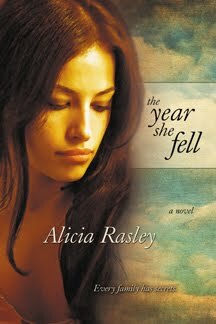 She blogs at edittorrent and has a brand new novel out this month, THE YEAR SHE FELL, published by Bell Bridge Books. Welcome Alicia! Congratulations on your book and thanks for stopping in to help with our plotting! 10. Backstory Blunders: The past is prologue, for sure, but you can tell too much too soon, if everything about the characters' past is explained right up front in Chapter One. 8. Limping to a Conclusion: You don't want the reader to think you ended the book just because you ran out of paper. Make the ending a conclusive one, reinforcing the themes of the book and the progress of the protagonist. 2. Structural Weaknesses: Many a good story is sunk by a weak structure: a hidden protagonist (the readers can't tell early whose story this is), meandering setups, misrepresented conflict, rushed climaxes, incoherence between the protagonist and the plot (the main character doesn't have much to do with the main plot, or this person would never do what the plot requires him to do). Much of this derives from a misunderstanding of the purpose of structure. It's not a prison, chaining you to a "formula", it's a map to help you and your readers explore the issues you're developing with this story. Learning structure can teach you when to modify it and when to branch out on your own. The key to structure, in my opinion, is understanding the concept of the story questions-- the question or problem your opening poses, and the events which combine to create the answer. ROBERTA: Alicia will stop in today to answer comments and questions. But first please I've asked her to tell us more about THE YEAR SHE FELL. It's set in West Virginia, and involves the richest family in town and the three sisters who must deal with their prominent family's legacy and tendency to bury important secrets. What might interest writers is my point of view technique— there are five sections, each narrated by one of the major characters, so five different voices. For the first time, I was asked to create a "reader's guide" with questions that book clubs might like to discuss. That was an interesting experience! I think we authors like to think that we answered all the questions and didn’t leave any ends untied. So I had to get beyond my natural defensiveness and really think about what issues the book had raised but never settled. The main issue is family secrets and whether sometimes discretion is better than openness. Several members of the Wakefield family are keeping secrets, and they'll always say their deceptiveness is for the good of the family. I hope you'll enjoy the story and the mystery it unfolds. It goes on sale November 15. While you're at my website or blog, check out all the articles and posts aimed at writers of fiction. What genre is your book? Is it a murder mystery? Does the reader know the family's secrets or do you slowly reveal them? Sorry--you gave such good advice I think some vital information about your own book was omitted. My question-concerning my own plot is: The weakness of the victim/protagonist, aren't all protagonists in mysteries usually victims? Amateur slueths must have a plausible reason for getting involved in solving a murder, especially when they're being framed, so even though they are not the murder victim, they've been victimized in their lives or professions in some way. What is the weakness factor? I'll look for your book - the story is intriguing. I realized there's something of a split between #8 and #7. As writers many of us wrestle with that sagging middle (OMG, how will I ever fill all those pages so I can get to the end?). But as I reader, more and more I find I'm enjoying a book with strong characters and compelling pacing--and then the writer seems to run out of steam at the end and just wraps the story up as quickly as possible. You can almost tell by looking at how many pages you have left. Only an eighth of an inch? The ending must be rushed. And that's disappointing. How do you keep the ending strong? Do you cheat and write that before the middle, just so you're still fresh and enthusiastic? I'm actually drawing a graph-line at the top of my word chart showing where I am in the book. It's really helpful to see --kind of like on a Kindle--where I am in the story. "Make sure every scene has at least one event that affects the main plot -- that way the readers can't skip without missing something important." Love this! This quote is going on my bulletin board. You had me at Tumors and Parasites. I'm sending my son -- who is writing his first novel in college - this link and hoping he reads it. The family doesn't even know the family secrets, so the sisters have to figure out what their mother is hiding. Well, as for your own question, victims in murder mysteries are usually dead, so that's not a problem. The sleuth has to have a reason to investigate, and what the reason is might determine the sub-genre actually. The sleuth in a cozy mystery like Miss Jane Marple usually doesn't need a personal reason to investigate. "The victim was the cousin of my goddaughter!" might be enough. But anyway, there's a difference between a character in conflict or in trouble (getting framed for a crime) and a victim-- it's all in the reaction. A victim (like the murder victim :) just lies there and accepts it. "Okay, I didn't do it, but I'm so weak and powerless and the prosecutor is so powerful. And the real murderer is probably someone rich, and there's no way I'll ever get out of the frame. So I'll just pack up my possessions and go plead guilty." THAT's a victim. So think about how your sleuth reacts to try to get out of the trouble you put her/him in. MaxWriter, well, if you don't want to plot in advance (and I understand! ), you might just concentrate on building a character who will respond in fun ways but also has some internal conflict that needs fixing. Think about creating the character who will incite interesting events, and then see what happens? Sheila, I know what you mean about the ending! I think first of course we should treat the ending as important, not just a wrapup, not just a pro-forma thread-tying, but the actual right ending to this set of events. But also I think sequence can matter. What needs to be finished in what order? Like generally (and this isn't a rule, just the way I tend to write), I have the interactional/romantic conflict fixed first, because I want the two of them to work together to fix the external conflict in the big climax scene. And then I want to show the internal conflict resolve in the resolution scene (the very end). I think it's important to think of these as separate scenes, not all wrapping up at once. So in the dark moment/crisis, the heroine can decide to trust the hero, thereby resolving the big romantic issue. Then together they can go after the bad guy in the climactic scene and resolve the external conflict. Then in the resolution, she can resolve her internal conflict of abandonment by choosing to let go of her dream of finding her lost mother, and instead turn to the future and agree to adopt the teenaged girl left orphaned by the murder. That is, if we think of each of the conflict-resolves events as a separate scene (in whatever order seems to work best), there's no limping to conclusion, because everything that needs to be settled is given sufficient importance. What do you think? Hank, that's a great idea! I think that the reader has an unconscious sense of "where I am in the story," and of course a conscious sense too, either with a Kindle version or a physical book. She can tell how much is left! And so she can sense if this middle is sagging too much, or if the ending starts too early. And my books suddenly made more sense, I think. Thanks for a wonderful article and a lot to think about! Thanks for the explanation. I guess I can't envision a protagonist not doing anything, so I guess I don't have that problem! Good luck on the book, it sounds...dysfunctional! Another variant on "whose story is it" is when the author falls in love with multiple viewpoint and we're 60 pages in and still don't know who is the protagonist (aka 'whose story is it?") For me, there has to be one, though I've had writers argue with me and say that there novel has 3 (or 4 or more...). Leaving me to scratch my head and wonder. Hallie, I know what you mean. I've gotten three chapters into reading a book without really knowing who it's about. I guess that's what the back blurb is for? Alicia, thanks so much for visiting with us. We love having you here!